The field of biomimetics, in which technology is inspired by nature, is intersectional by definition and has provided several industrial fields with some really interesting processes lately. Some mechanisms in nature are so spectacular and ingenious that it would truly be a waste not to learn from them. One such example is the bombardier beetle. It defends itself by rapidly squirting high-pressure jets of boiling liquid at predators. The 2 cm long innocent-looking beetle is equipped with a unique natural pulse combustion technique and a sophisticated ejection mechanism that enables it to blast the toxic liquid up to 20 cm with amazing precision. This ability of the insect has been known for a long time but researchers found new possibilities by looking at it from a physics and engineering perspective instead of a biology perspective. For instance, numerical and mathematical modelling has been used to analyse the shape of the combustion chamber. The research has been led by Professor of Thermodynamics and Combustion Theory at Leeds, Andy McIntosh, and the work has resulted in the new technique µMist™. It is an effective and eco-friendly mist carrier system that makes it possible to control droplet size, temperature and velocity closely. It is therefore believed to have great potential in medicine, fire fighting, fuel injection or other industrial fields. Nature strives for maximum achievement at minimum effort and this interdisciplinary and innovative research project did not only result in a product; the scientists also learned much more from it than they had expected. Read more about the project here or this recent post about another intersection between nature and industry. Jeff Monaghan has some interesting ideas about what you can do to ”get the wheels turning” and start The Medici Effect. Read this post on his blog How To Market a Service. 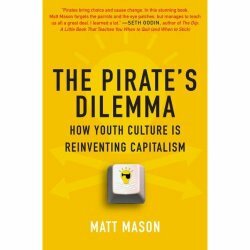 Today Matt Mason is launching his new book The Pirate’s Dilemma: How Youth Culture is Reinventing Capitalism! Here is what I wrote about it when asked to blurb it: “Through a tornado of hip-hop beats and remarkable stories, Matt Mason takes us on a riveting journey to the heart of innovation. In this explosive book, he shows us that companies face a stark choice: Will you allow yourself to be gutted by a pirate or will you actually become one.” Well – I meant it. This is a must read for anyone interested in where we are heading in the world of IP rights, piracy and innovation (which should be most of us). His core thesis: pirates have always played a key role in innovation and that sometimes companies should compete with pirates rather than fight them. Example: Apple’s move into the music business with iTunes. Also check out this slideshare that summarizes Matt’s ideas nice and neatly or the YouTube video of a specific Pirate Dilemma. Pick it up and read it. In my previous post, about the C-more Interactive Glasses, a number of potential areas of use for this product were mentioned. The breakthrough for the inventor Erik Lundström, however, was that the American Department of Defence became interested. The application of the glasses that caught their attention is a direct result of Lundström’s diverse background; earlier he studied pedagogy, and at one point he interviewed handicapped children for a communication project. He learned that there was a picture symbol language called Bliss that is used by people who find it difficult to use words. Based on that experience he initiated the development of software for communication with military symbols. The point is that this symbol language can be used via the C-more Interactive Glasses. That means that soldiers wearing the glasses can communicate silently without using their hands and even without knowledge of each other’s languages. When Lundström developed this system he didn’t even know that language barriers cause enormous problems within NATO – he just thought is was a good idea. And – as I have mentioned – great innovations will find its uses. He was invited to the Pentagon and demonstrated a simulation of the system. Earlier it had been difficult to find venture capitalists but now they work hard to have a prototype ready later this spring. Lundström’s product is an example of innovation catalyzed by obstacles and limits as well combinations of experiences from different fields. The ability to see these things and work his way towards solutions makes him an extraordinary intersectional inventor. When inventor Erik Lundström was in a hospital eleven years ago he met a seventeen year old girl who was totally paralyzed after a diving accident. She told him about her wish be able to continue with photography and he took it as a challenge; he decided there and then to come up with the necessary technology. His starting point was a far-fetched idea that he could use ECG sensors. They are designed to sense the movements of heart muscles but Lundström used them to capture movements of facial muscles instead. The device this resulted in was clumsy and ugly but it worked. 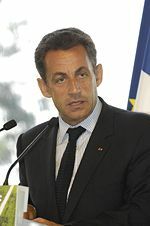 After that he developed the technology to enable people with different kinds of disabilities to control computers via eye movements. By combining these solutions with already known technology his company Penny has now produced the C-more interactive glasses. They replace screen, keyboard and mouse and control a pocket PC. 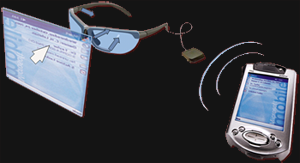 The glasses contain two micro screens that are reflected on the eyes and the sidepieces contain sensors that capture movements of the jaws. At the same time the wearer sees what’s in front of him or her. Even though the concept was born to make technology accessible to users with disabilities the most interesting aspect from a business perspective is that it has great potential in so many other contexts. Surgeons, dentists and different kinds of mechanics can make use of hands free computer equipment. Not to mention the computer game industry. The same phenomenon is described in my earlier post about the BRIGHT Atom teaching aid; an invention that is generated by the specific needs of a minority turns out to be useful also to many people not belonging to that minority. This is one reason why diversity drives innovation.